The training program for the new members was held on Jan. 15 for the first time. 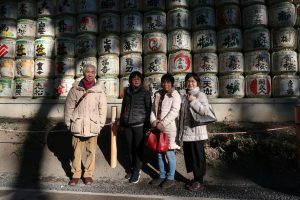 The veteran took the four participants to the popular touristic spots in Tokyo and mainly explained what would interest our guests and or draw their attention but almost nothing about detailed histories. The result was satisfactory and they enjoyed this short tour in addition to get to know various tips at the occasion of the guide. The president of our association considers this program important so that the new members start their volunteer guide. This program will continue because our aim is to make our guests satisfied with our attendance. Copyright © Kashiwa Goodwill Guide All Rights Reserved.